The following was gracefully provided by Steve Beszedits. 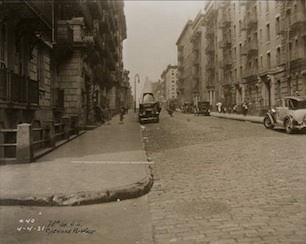 Formally opened to tenants on January 5, 1912, as the East River Homes, this unique group of four interconnected six-story buildings in mid-Manhattan was erected as a model tenement to house poor working class families with one of more tuberculosis-infected members. It was conceived by Dr. Henry L. Shively, head of the tuberculosis clinic at Presbyterian Hospital; funded by Mrs. William K. Vanderbilt Sr. (née Anne Harriman); and designed by Henry Atterbury Smith. Smith incorporated a number of ingenious features to make the buildings as healthful, sanitary, safe, and comfortable as possible. He paid particular attention to providing abundant light and air, two basic necessities most beneficial to tuberculosis sufferers. The ample funds allocated also allowed him to indulge in architectural design and detailing that was unprecedented in philanthropic housing. Several parts of the complex – most notably the richly-tiled passageways connecting the interior courts with the streets, the open stairways, and the tiles on the underside of the projecting balconies – were executed by the Guastavino Fireproof Construction Company; a remarkable enterprise whose outstanding creations grace many of New York City’s finest edifices, among them the Great Hall on Ellis Island, the Oyster Bar in Grand Central Terminal, and St. Paul’s Chapel at Columbia University. From the very beginning Mrs. Vanderbilt’s project was closely followed by the press not only in New York City but overseas as well. Great Britain’s prestigious medical journal The Lancet commented in its April 3, 1909, issue: “Her object is to show, by an experiment on a large scale, that such accommodations may be constructed and managed to save human lives … Should she succeed in demonstrating this her example will, no doubt, be followed …” The New York Times, December 1, 1912, declared: “It is possible that nowhere in the world is there a more comfortable, sanitary, and beautiful tenement than Mr. Vanderbilt’s East River homes.” The complex also garnered enthusiastic endorsement from housing reformers, social activists, and the medical community. Two months after opening the buildings became the site of the Home Hospital, an ambitious long-term study sponsored by the Association for Improving the Condition of the Poor (AICP), one of New York’s oldest and most influential charity organizations. The project sought to demonstrate that by housing a patient having a virulent case of tuberculosis and his family in a salubrious home environment under medical supervision would not only result in recovery but, at the same time, keep the family intact and ensure that the disease would not spread to healthy individuals. 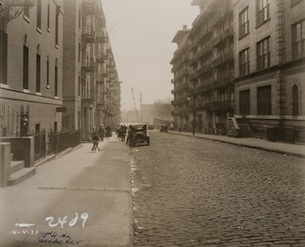 The charitable trust governing the East River Homes was dissolved in 1923 and the buildings were sold to the City and Suburban Homes Company for rental apartments the following year. In the 1930s the pergolas and recreational facilities on the roof were removed, kitchens were relocated from the living rooms, and the bedrooms were enlarged by reducing the total number of rooms on each floor. On July 9, 1985, the New York City Landmarks Preservation Commission – citing the complex’s prominent role in the fight against tuberculosis as well as its distinctive architectural features – designated it as an official landmark. In 1986, it was renamed the Cherokee Apartments and converted to cooperative ownership status. The Cherokee Apartments is mentioned in numerous books about New York City’s architecture and places of interest. For example, Paul Goldberger wrote in his The City Observed: New York (1979): “At the Cherokee one senses an order an a place for each resident that makes him, as he stands at his balcony or crosses through the courtyard, feel unique.” Francis Morrone’s The Architectural Guidebook to New York City (1994) opines that “these buildings impart to 77th Street and Cherokee Place a powerful. brooding, romantic sense of enclosure.” On NYREALTY.COM’s list of the “Top Ten Balconies, East Side,” the Cherokee ranks second, superseded only by the Trump Plaza. Due to its wonderful architectural characteristics, the complex has attracted several moviemakers over the years. In November 2003 the premises hosted the cast and crew of Stay, a film directed by Marc Forster and starring Ewan McGregor and Naomi Watts. More recently, director Robert De Niro shot several scenes for his The Good Shepherd, featuring Angelina Jolie and Matt Damon. However, all of this footage wound up on the cutting room floor.